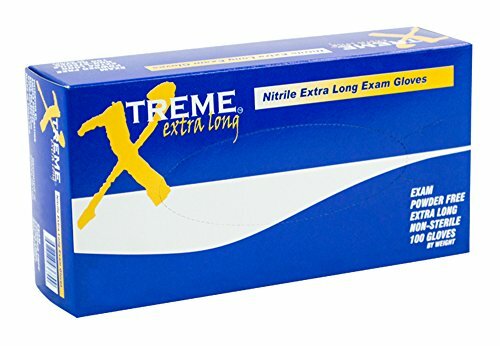 The Ammex Xtreme industrial-grade nitrile, powder-free glove has a palm thickness of 4 mils and a finger thickness of 5 mils and is 12" long from the tip of the middle finger to the edge of the beaded wrist cuff, which is 3 mils thick and extends to cover the hand, wrist, and forearm. Nitrile provides better elasticity than vinyl, better puncture resistance than latex or vinyl, better abrasion resistance than chloroprene, and reduces the likelihood of allergic reaction. This glove is suitable for non-medical uses, including use in the automotive industry or for other heavy-duty applications. The glove is textured on the fingertips, fingers, and palm for improved grip, particularly in wet environments, compared to gloves with textured fingers. This powder-free glove leaves no residue, reducing the risk of contamination compared to a powdered glove, making it suitable for use in electronic components, forensic, and laboratory applications. This ambidextrous glove is blue. This glove has a minimum tensile strength of 14 megapascals (MPa) before aging and 14 MPa after aging. Tensile strength, measured in MPa, is the amount of force required to rip a glove; the higher the number, the stronger the glove material. This glove has an elongation of 500% before aging and 500% after aging. Elongation measures how much a glove can be stretched before it breaks. It is expressed as a percent of the original length of the glove at the moment of breakage; the higher the percent, the more the glove can stretch. This glove has an Acceptable Quality Level (AQL) of 1.5, which means the defect level from a large sample of the gloves will not exceed 1.5%. AQL is a Food and Drug Administration (FDA) quality specification for the defect rate in surgical and exam gloves. The FDA requires an AQL of 1.5 for surgical gloves and 2.5 for exam gloves. Disposable and limited-use gloves are used in medical, forensic, scientific, food service, and industrial applications. Disposable gloves are commonly made from flexible materials such as latex, nitrile, chloroprene, and vinyl. While most disposable gloves are designed for use on either hand, some can be purchased in hand-specific models. They are offered powdered or powder-free; silicone or silicone-free; chlorinated or non-chlorinated; coated or uncoated; with a standard- or extended-length cuff; sterile or non-sterile; and with textured or smooth fingers, fingertips, and palms. A glove's abrasion, cut, and puncture resistance are defined by glove material and thickness, and may be improved with the use of exterior coatings. Abrasion resistance means the glove helps protect the hand from contact with rough surfaces. Cut resistance means the glove helps protect the hand from blades and sharp instruments. Puncture resistance means the glove helps protect the hand from objects such as needles. Chemical resistance means the glove helps protect the hand from certain chemicals, and varies by glove material. For information on the chemical resistance of this glove, consult the manufacturer's chemical resistance guide. Ammex distributes medical and industrial products such as gloves, first aid supplies, face masks, and other protective coverings. The company, founded in 1988, is headquartered in Kent, WA.